Chinchasuyu was the northwestern provincial region of the Tawantin Suyu, or Inca Empire. The most populous suyu (or Quarter, the largest division of the Inca Empire), Chinchaysuyu encompassed the former lands of the Chimú empire and much of the northern Andes. 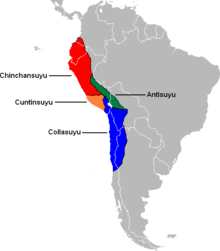 At its largest extent, the suyu extended through much of modern Ecuador and just into modern Colombia. Along with Antisuyu, it was part of the Hanan Suyukuna or "Upper Quarters" of the empire. The name is due to the Chincha culture, which was a trader kingdom in what is now the Ica Region. Chinchay in Quechua means jaguar and also means the cardinal point North. 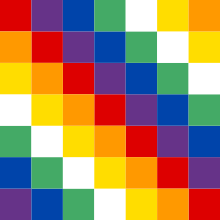 The four suyus of the Inca empire. Chinchaysuyu appears in red. Atavillo of Atawillu, in the modern province of Canta. Chinchayqucha, also called in sources by the name of Junín. Lambayeque, whose people spoke Mochica. Lima or Rimaq, a large province of perhaps 150,000 inhabitants. Lurin, home of the Oracle at Pachacamac. Ocro, including both the Ocro and Lampa tribes. Virú or Wanapu, likely the origin of the word Perú. Yauyo, including the Larao tribe.